Back in June, we reported that Top Gear was building what it hoped would become the world's fastest lawn mower, and had solicited help from Honda and its British Touring Car Championship partner Team Dynamics. Well, they've finished the build and the resulting contraption is the Mean Mower. With a top speed estimated to be over 130 miles per hour, it should beat the 96.529-mph record set by Bobby Cleveland and his Snapper race mower at the Bonneville Salt Flats in September 2010, and take the cake as the fastest lawn mower ever. Let's start off with the specs: 109 horsepower, 309-pound curb weight and 0-60 mph in four seconds. Crazy numbers, but maybe you'll be comforted that the lawn mower is a Honda HF2620 in name only, with a custom chassis made of 4130 chromoly, a 1,000cc engine from a VTR Firestorm, a paddle-shifted six-speed transmission, a bespoke suspension and wheels from an ATV. The body was sourced from the production mower, however. Sure, it can cut grass - at 15 mph, double the top speed of a regular HF2620 - using two electric motors spinning 3mm steel-cutting cables at 4000 rpm, but the grass bag has been reengineered to house the fuel tank, a high-capacity oil cooler and a secondary radiator. So much for that clean cut. Honda says that it has topped 100 mph on track, but there's no video to verify this. (Please Honda!?) But there is a great teaser with reigning BTCC champion Gordon "Flash" Shedden mowing the lawn in a mean way, below. 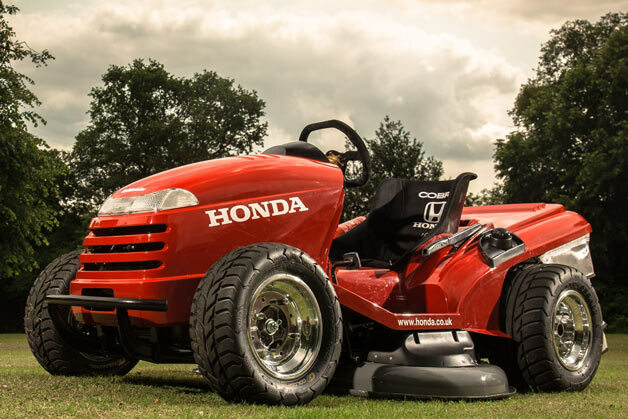 Honda Mean Mower hits 60 mph in 4 seconds, cuts to 130 mph [w/video] originally appeared on Autoblog on Wed, 17 Jul 2013 19:01:00 EST. Please see our terms for use of feeds.